Three years ago, our first child was born. In preparation for her birth, my husband and I went to an all-day birthing class. I seriously considered leaving during the part where the instructors explained what to expect in the event that you needed a c-section. That’s how sure I was that I would have a beautiful, all-natural, perfect-in-every-way childbirth. That is, until I was about 33 weeks along. I was getting bigger and bigger, and I was starting to notice how uncomfortable I was due to this big hard, round “thing” at very top of my belly, which I assumed HAD to be her head. She kicked around a lot, she had hiccups ALL the time and would wiggle around a bit, but that big ol’ head never budged. She was complete breech, meaning her bottom was right on top of my cervix and her legs were folded up. 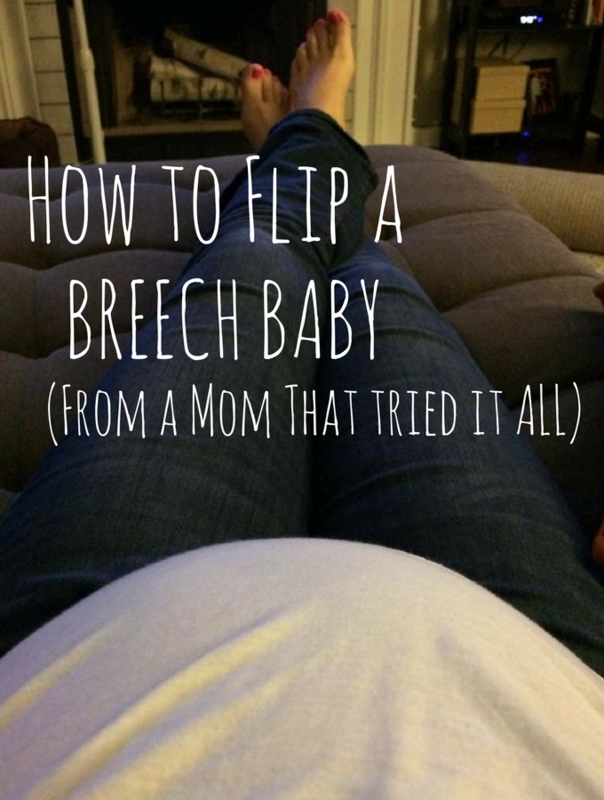 At about 34 weeks, I started frantically googling “how to flip a breech baby” and I tried just about every technique out there. It should go without saying, but please do not try any of these things until you’ve first consulted your doctor. I’m not telling you that you should do anything in particular, I’m simply sharing my experience with you. Every pregnancy is different, and what worked or didn’t work for me could be completely different for you. 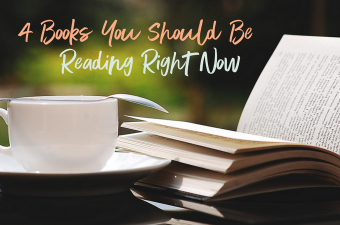 There are a lot of websites that will give you all kinds of recommendations. This is just my personal experience. On my baby flipping mission, I started with the easiest, quickest methods and worked my way up to the most extreme as I became more desperate. 1. Ice at the top of my belly while my husband talked to/sang to my crotch. I’m sorry for subjecting you to the word “crotch,” but I had to. We totally tried this, numerous times. I would put a frozen gel pack at the top of my belly (basically right on top of her head), in hopes that she would move away from it. (Sheesh, thinking about these things now makes me feel bad for my poor little fetus!) Truthfully, I think she liked it. So, I enlisted my husband to use his voice to entice her to move away from the ice and towards the sound of her dad. We did this MANY times, to no avail. This was very uncomfortable for me, so I didn’t do it as often. I would lay on my back for a few minutes at a time with my hips on top of a large pile of pillows. The idea is to give more room at the bottom of your uterus so the baby can flip around more freely. She was not interested in the least. Although I’m sure it was at least a little entertaining for my husband to watch me attempt to gracefully get in this position as a hugely pregnant person. It’s tricky. Basically, get into childs pose and rock back and forth. It’s the same idea as the pelvic tilt. Get your bottom higher than your head, and let your belly hang down to create more free space for baby to move. I did A LOT of this one. It made my back feel pretty good, but it did nothing to get her to flip. I would even combine this with the ice pack trick. Fortunately, my in-laws have a nice pool, so I’d go over there and float around in hopes that the buoyancy would allow my baby to have the freedom to move into the position I so desperately wanted to her in. I even tried doing underwater flips a few times. Again, it was great relief for my back, but did nothing to get her to flip. This was my first, and at this point my only, experience with acupuncture. I can’t honestly tell you the theory behind why it’s supposed to work. I was in crazy pregnant lady desperation mode, and I read somewhere that it has worked for people. So, I made an appointment. It wasn’t supposed to work with just one session, so I can’t have a completely educated opinion one way or another on this because I went into labor before I had time to go again. I can say that I didn’t particularly enjoy being in one position with needles poking out of my ankles for that long. Ok, this is the weirdest technique I tried. Oddly enough, it was the one that produced the most results. I had heard the term “moxibustion” from my OB doc, and a labor and delivery nurse I know had mentioned it as well. At my acupuncture appointment, the acupuncturist gave me a couple sticks of Moxa, or “Mugwort”. Moxibustion is supposed to work similarly to acupuncture in that it works to heat up acupressure points. According to Chinese Medicine theory, the heat from the burning Moxa sticks at the correct acupressure point is supposed to promote movement and activity, hopefully enough to get the baby to move it’s rear-end out of position and do a flip to the head down position. For days, my very accommodating husband would light the sticks on fire (they look like little cigars) and when they were smoldering, he’d hold them next to my pinky toe, waving them around close to my skin as long as I could stand it on each side before he’d switch to the other foot. The last few times we did this, I would notice my belly moving in all kinds of strange ways. At one point it felt like my baby had squeezed her entire self into the the right side of my body, which she had never done before then. It never did cause her to completely flip over, but I can’t say that it wouldn’t have if I’d had time to continue trying it before she was born. This was actually my first experience with a chiropractor as well. The Webster Technique is only done by certain practitioners.. if you’re considering it, I’d recommend doing your research and find someone in your area who does this often and is very proficient at it. The Webster Technique is an adjustment for your hip/pelvic area that is supposed to realign your pelvic bones and balance out the ligaments and muscles around your hips, pelvis and uterus to allow the baby room to reposition themselves. I was nervous for this because I’d never been readjusted by a chiropractor before, but it actually felt really good. Especially so because I’d been having quite a bit of hip/pelvic pain. The chiropractor was an incredibly sweet and empathetic person. She actually had tears in her eyes when we talked about what would happen if all of these things I was trying wouldn’t work. She thoughtfully shared her feelings about how beautiful bringing life into the world and bonding with your baby is, no matter how you end up delivering. Her passion and the emotion she allowed herself to show me helped me accept the situation way more than even doing the adjustment. I was only able to try this one time before I went into labor, so it’s hard to say if it would work. It was recommended that I come back to do it again. Looking back on this now, it seems borderline barbaric. This was a pretty painful experience. External cephalic versions are done in a hospital setting because there’s a risk of ruptured membranes, among other possible complications that could result in needing to deliver immediately. This is also one of the reasons that this procedure is usually reserved for after you reach “full term” (typically after 37 weeks gestation). I showed up at the L&D department at 37 weeks pregnant. The nurse started an IV, then the doctor (not the Ob/Gyn I’d been seeing) came in to chat. She wanted to give me a spinal epidural and do the procedure in the OR, in case anything went wrong. 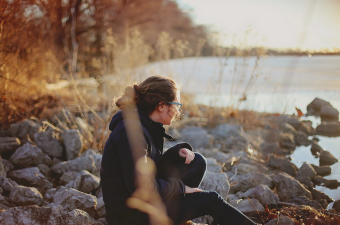 I had not expected an epidural, and told her I needed to think about it. When the doc left, the nurse told me that she is the only MD there that opts to do it that way. I had been advised before the appointment that it’s better to do this without an epidural, because you can tell if they are pushing too hard. So, we went ahead with the procedure without the spinal. They gave me a medication through my IV called Terbutaline. This is a “tocolytic” medication, meaning it suppresses uterine contractions, because it’s easier to manipulate the baby in a relaxed uterus. It also causes an increase in your heart rate, which made me feel quite a bit more anxious about the whole thing. There were two physicians in the room, one standing on each side of me, both with their hands on my abdomen. They started by pushing the baby upwards so that she wasn’t wedged in my pelvis, and then proceeded to work together to push her into a transverse position. They were able to get her that far, and kept saying “she’s almost there!” I remember one of the doctors faces turning red, scrunching up as she strained to shove the baby through my abdomen. My husband was watching, and I also remember his face, his eyes wide and hand up to his mouth. Afterward he told me that he could see the whole outline of the baby in my abdomen. I think it was very unsettling for him to watch how hard they were pushing on his wife and unborn baby. Well, she wasn’t almost there. They were unable to get her to flip, and she ended up in the same position as when we arrived. Our sweet baby girl decided to make her entrance into the world 3 days after the version procedure. My water spontaneously broke in the middle of the night, and I delivered her as a complete-breech via c-section at 5:00am. She had “froggy legs” for the first week or so. You could pull them straight down, and they’d bounce right back into the position they were in while in the womb. She had an ultrasound to check for hip dysplasia, but it wasn’t an issue for her. I remember the nurse saying, “don’t worry honey, her head will go back to a more normal shape, it’s just formed like the top of your uterus right now from being in that position for so long.” And I remember thinking, “what?? what’s wrong with her head? ?” Not to worry, her head is just fine. I think sometimes women tend to wear their birth stories as a badge of honor, the highest award going to the women that successfully pushed their babies out without any drugs in 30 minutes and refer to it as “beautiful.” Well guess what ladies..you should wear your birth story as a badge of honor NO MATTER how it happened. It is HARD. It is INCREDIBLE. It’s LIFE CHANGING. And no matter how that baby comes out, you’re now a mom for the rest of your life, and that means so much more than how you choose (or don’t get to choose) to birth them. There are so many variables out of our control. 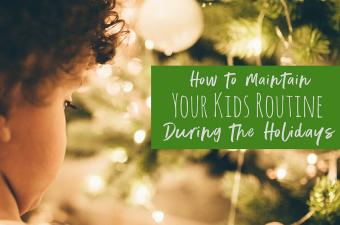 If you’re a mom with a breech baby, (and I bet you just might be if you’re reading this), and you’re trying all of these techniques, way to go mama. You just might be able to make it happen! I have SO been in your shoes. Just know that, even if it doesn’t work out the way you’d hoped, it’ll be ok. I had a hard time hearing that before she was born, but the day she came out the ONLY thing I cared about was that she was healthy and safe. I was afraid that our second baby would also be breech, but I ended up having a VBAC (vaginal birth after cesarean). (Come back to the blog on Monday for a comparison of a vaginal birth versus a c-section..) Now that I’ve done this whole birth thing both ways, I can tell you that neither one is easy. Don’t let anyone tell you that you “got off easy” if you had a c-section. That’s major surgery and the recovery is really tough. Some people have these picture perfect vaginal deliveries, others have incredibly stressful, difficult c-sections. Take in that experience for everything it’s worth, no matter what it looks like. I know you are doing your best, no matter how your story goes.